Wow this is absolutely beautiful and warm like golden sugar. I’m surprised there are no comparisons to Kenzo L’Elephant minus the oriental spices associated with that fragrance: cardamom, cloves, cumin, caraway etc. L’Ambre is reminiscent of hot spicy chai with lots of cinnamon and vanilla powder; it feels so cozy and makes me want to crawl into bed and hibernate all winter lol. The opening is bright amber with drops of sweet vanilla, this smells like a warm creamy dessert infused with toasted brown sugar and cinnamon spices. A boozy patchouli underlies this sugary accord, but it’s neither cold nor sharp. In fact the patchouli is subtle and mildly woodsy; it doesn’t come off as being too bitter or intrusive like most scents dominated with this note. Labdanum is discreetly mixed into the dry down to give a soft and airy fragrance that feels minimalistic and honest, like bright and transparent amber. Although L’Ambre is distinctively a sweet scent, it’s certainly unconventional. Unlike most sugary perfumes this one doesn’t feel narcissistic (it doesn’t stand there screaming obnoxiously) neither does it seek attention in crude ways. L’Ambre feels wholesome and modest, she’s sweet and inviting like apple pie, but still retains an aura of mystery. Men are drawn not only to her discreet nature but also her feminine charms; she inspires poetry in those lucky enough to fall in love with her. 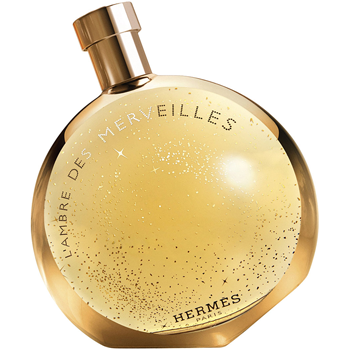 Overall a magnificent perfume by Hermes, and one that feels perfect for those long winter months. L’Ambre is inoffensive while the longevity is quite good; it’s unisex though I associate this fragrance as strongly feminine. Highly recommended for those who enjoyed Kenzo L’Elephant but found the myriad of spices too strong and bitter; L’Ambre is perfect for gourmand lovers as well.